These are a few new paintings, just until I get some more up. I will be starting an etsy account soon and will link here when I do. Interested people will be able to buy my original paintings from that site when it’s up and running, but enjoy these for now. These are some new paintings along with some old paintings. Many of them were paintings I haven’t had access to for various reasons. I’m in Burns Lake for the summer and I’m planning on doing a lot of painting while I’m here so stay tuned, more art on the way. I’ve been working steady on my paintings and I haven’t finished any of the big projects I’ve been working on but I decided to post some of the smaller things that have been going through my head. The painting titled “Cathedral” was started in 2012 and then left to collect dust since then. As it was painted on raw canvas I was worried about its stability over time so one of the reasons I went back into it was to try to improve its longevity. When painting on raw canvas there are several issues that can become apparent over time, if the fabric isn’t washed before being painted on it will discolour over time due to chemicals in the fabric. And, if you use anything but distilled water on the canvas that can also cause issues with stability over time. The single biggest problem with raw canvas is that it’s very hard to clean and accumulates dust over time. So, in addition to reworking the painting I made an effort to improve its durability. I’ve been moving away from raw canvas lately but continue to use it in certain circumstances. The other painting in this post (the 18 x 24 untitled) is as durable as paintings can be. Stretched on washed and gessoed canvas, protected for support induced discolouration (SID) and then coated with two layers of a GAC-500 isolation medium and finally varnished with a UV resistant, removable polymer. Paintings done like this one are easy to clean and can last a very long time without changing at all. Here are some new pieces I’ve been working on, more than half are unfinished but it’s always good to get feedback. Let me know what you think. 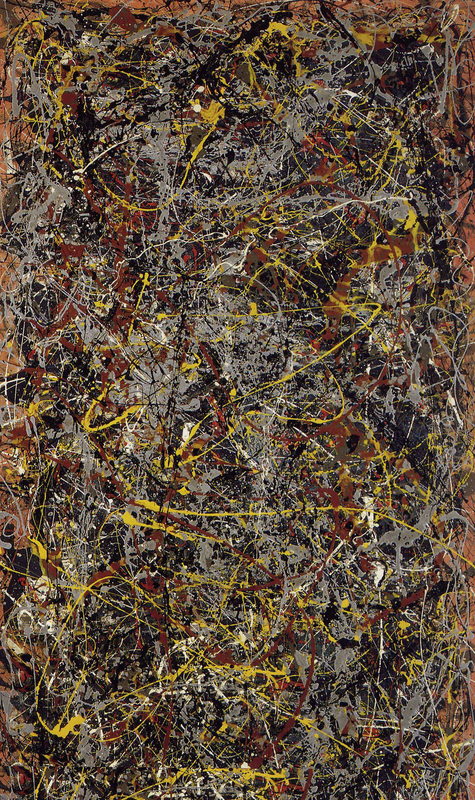 Jackson Pollock’s painting “No. 5” was originally titled “Bacchanalia” by Pollock – How does the image of Bacchus change the reception of this painting, perhaps invoking the image of a dancer or festivities? Does it change how you perceive this painting? Roland Barthes wrote, in “The Death of the Author” that a work of art (or anything creative) no longer belongs to the creator when they are finished it. We look to the author or the artist for an explanation of the work of art when they are usually the least equipped to offer such an explanation due to their lack of objectivity. The artist only knows his intent, and very rarely sees the actual result of his labours. It is the audience who controls what becomes of the work of art, the artist only offers the project to the public. The point is that you never really know what you have. When an artist says “I like to let my art speak for itself” it’s because they really don’t know what they have, and I think any honest artist would be willing to admit this. The history of the painting (the process) or the intention of the artist may be interesting but the creator never has the last word when it comes to critical analysis of their own work. Jackson Pollock numbered his paintings to avoid people projecting the title onto his image but, since his numbers weren’t in sequence, people tried to decipher the meaning of the numbers to understand his paintings.